5 simple homemade aromatherapy gift ideas - Amphora Aromatics Ltd – Supplier of pure essential oils and aromatherapy Products. The idea of making your own bespoke gifts may seem daunting, but it really can be made so simple. There are many ways of creating unique, personalized gifts using as little as two or three ingredients. Making your own toiletries and cosmetics is a great way to get creative with scents and colours, plus when they are homemade, you can rest assure there are no nasty chemicals and unwanted additives that you may find in a finished, store bought product. It’s also a great chance to learn lots of recipes so you can make them again, plus it’s a great way to save money!! This luxuriously rich, all natural moisturizer makes a gorgeous gift (or it’s also great to use on yourself for some home pampering sessions). It contains some lovely ingredients which help nourish and protect the skin (ideal for use during the colder months of the year). What’s more it smells and looks delicious (although do not attempt to eat it!). 30-35 drops of Vanilla Extract Oil (or an essential oil of your choice). Simply combine all the ingredients, except the essential oil, in a *double boiler and gently heat on a low temperature. Keep stirring until they become liquid. 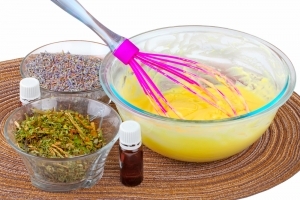 Once this is done, allow the mixture to sit for roughly 15 minutes and then add your essential oils. Next place the mixture in the fridge and allow it to set. Once this is done, use a mixer to gently whisk the mixture into a fluffy consistency (or until you are happy with it). This may take up to 5 minutes. When your mixture is ready, simply scoop into your desired container (a glass kilner jar would be ideal). *To make a double boiler, simply fill a regular saucepan with water and set to the desired heat. Next place a glass mixing bowl on top to put the ingredients in. This allows you to melt down the ingredients more slowly s they don’t burn or seperate. These make the perfect gift for the winter time when we most enjoy taking a long, hot bath. The great thing about these bath melts is that they contain a number of natural ingredients with excellent moisturizing properties, which help to nourish the skin during the cold winter months. Essential Oil 30-40 drops (we’d recommend relaxing scents such as Lavender, Ylang Ylang or Sandalwood). Silicon moulds (these can often be found in a homeware store in the kitchen section and they come in all sorts of different shapes to choose from). Using a double boiler, gently melt down the Shea Butter and Cocoa Butter until it becomes a liquid form. Next add your dried herbs (if you are using them). Add 3-4 drops of essential oil in each of your moulds and then carefully pour your mixture on top. Simply leave your mixture to set in the moulds (you can pop them in the freezer to speed things up). When they have solidified, gently remove them from the moulds and store them in a cool place. Solid perfumes make the ideal stocking filler; you can get really creative in blending oils to suit your preferences and they are really easy to make. The lovely thing about solid perfumes is that they can be made with 100% natural ingredients (and you can also avoid using alcohol which may be used in traditional spritz perfumes). Salt scrubs are incredibly easy to make. They can be made from as little as two ingredients and they make the ideal gift for anyone who loves a good pampering. They can be used in the bath or shower to gently exfoliate the skin, leaving it feeling soft and smooth. Lip balms make the perfect stocking filler!! They’re incredibly easy to make and they are a really useful gift for this time of year when our lips are subject to cold weather conditions, often leaving them dry, damaged and chapped. This ever so simple recipe is 100% natural and contains some gorgeous ingredients which really help to nourish and protect the lips. 1 ½ tablespoons of Beeswax pellets (for vegan options you can try Soy wax flakes). These measurements will fill roughly 3 of the 15ml jars or tins; you can obviously increase or decrease the measurements depending on how many you make. *Tip – because the mixture tends to solidify very quickly, I found it is best to do 2-3 jars at a time to make life easier (and less messy). Using a double boiler, gently heat up the beeswax, carrier oil and Coconut oil until it has melted. Next turn off the heat and add the essential oil(s) and gently stir them in. Your mixture is now ready to pour into your containers. Simply allow your lip balms to dry naturally (they will solidify fairly quickly, but you can speed the process up by popping them in the fridge for a few hours). Thank you for taking the time to read this blog and we hope you have been inspired to create your own homemade, all natural gifts.